We love Buffalo wings... but not the part where our hands get covered in sauce. This fun twist on the classic is less messy and tastes fantastic! Pound chicken to an even thickness, and season with salt and pepper. Bring a skillet sprayed with nonstick spray to medium heat. Cook chicken for about 4 minutes per side, until cooked through. Transfer to a cutting board. Meanwhile, in a medium bowl, combine yogurt, hot sauce, and 1 tsp. water. Mix until uniform. Chop chicken and add to the bowl. Stir to coat. To make the topping, in a small bowl, combine yogurt with hot sauce and 1 tsp. water. Mix until smooth. Fold in blue cheese and Parm. Mix until uniform. On a microwave-safe plate, microwave tortillas for 30 seconds, or until warm. 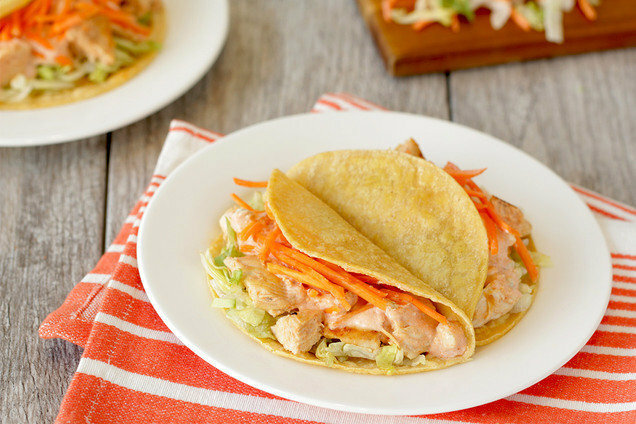 Evenly distribute lettuce and chicken mixture among the tortillas, followed by the topping. Sprinkle with carrots. With a rolling pin, flatten thawed waffles as much as possible. Evenly drape each waffle over one side of an 8” X 8” baking pan, like upside-down tacos. Plate waffle taco shells, and let cool. Reduce oven temp to 375 degrees. Spray the baking pan with nonstick spray. Meanwhile, in a wide bowl, mix breadcrumbs with seasonings. In a second wide bowl, mix egg whites/substitute with maple extract. Pound chicken to an even thickness, and cut into 4 thin strips. Place in the bowl of egg whites/substitute, and flip to coat. One at a time, shake chicken cutlets to remove excess egg, and lightly coat with seasoned crumbs. Evenly place in the baking pan. Flip chicken. Bake until cooked through and crispy, 8 - 10 minutes. 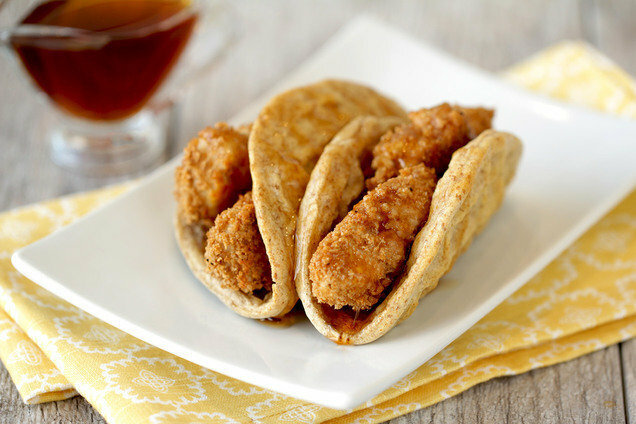 Place chicken in waffle taco shells, and drizzle chicken with syrup. HG Alternative: We call for lite syrup as opposed to sugar-free syrup because it's easier to find natural lite options. If made with sugar-free syrup, this recipe will have 360 calories (Freestyle™ SmartPoints® value 5*; SmartPoints® value 9*). Hungry for More Healthy Taco Recipes? It's May 4th, a.k.a. Star Wars Day... May the 4th be with you! (Get it?!) If you're planning a movie marathon, we recommend these DIY popcorn treats!